Rose Heyworth Colliery Original Waste Tip. An image of the original Rose Heyworth Colliery waste tip at its height, in relation to the valley. 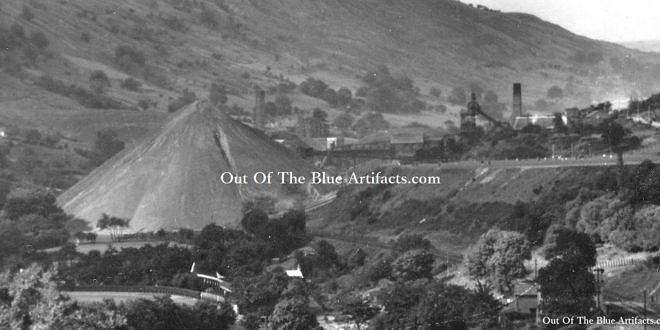 Points of Interest – The image (taken in about 1930-1940) shows the Abertillery Rugby Grounds in the foreground with the colliery waste tip dominant in the valley. Behind the tip are the derelict out-buildings of the South Griffin Colliery with a chimney stack. To the right is Rose Heyworth Colliery and the tramway from the pit spanning the railway lines to the tip can easily be seen. Far right is the Abertillery Intermediate County School playing fields. The playing fields were built on a council owned household rubbish tip. Tipping of household rubbish had only ceased there in the late 1920’s and the council utilised the ground for the county school playing grounds. Up through the valley was the main railway lines which is now the A467. The school playing fields were wider on this image as to what they are today. In 1987 the school playing fields were made narrower during the construction of the new main road A467, when it was necessary to take ground for the widening of the old railway track to lay the new road. The road took the route of the old railway lines up to the colliery and then slightly deviated to the west, then just before the houses at Bournville the route went back to the railway line. On maps the railway lines occupied a line that went over the the ground where the industrial units are today. I believe it was to straighten the line of the road around the county grounds.